Disabilities Education Act (IDEA 2004). 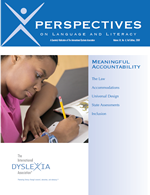 The issue was developed by guest theme co-editors Candace Cortiella, Director at The Advocacy Institute, and Rachel Quenemoen, Senior Research Fellow and national technical assistance team leader at the National Center on Educational Outcomes. Order your copy of this important issue!